"The club resolve to present by subscription a new Creel and Shawl to the best female golfer who plays on the annual occasion on January 1 next, old style (January 12 new), to be intimated to the Fish Ladies by the Officer of the Club. "Two of the best Barcelona silk handkerchiefs to be added to the above premium of the Creel." The golf played in those days must have made severe demands on the strength of its devotees, for the clubs then in use were extremely heavy and cumbersome, the links had practically no fairway, so that the ball had frequently to be played out of the most hazardous of lies; and the balls, being made of leather tightly stuffed with feathers, required the application of considerable muscular force before they could be made to fly any distance. 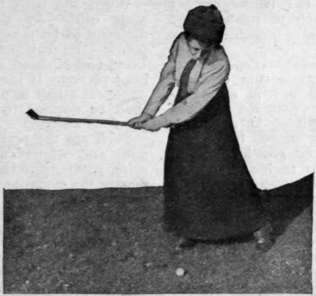 It is, therefore, hardly surprising that golf seems to have been in the background during the early Victorian and "crinoline" period, to emerge in the year 1872, when the London and Scottish Ladies' Golf Club on Wimbledon Common was founded. Twenty-one years later, in 1893, a great era in the world of women's golf was marked by the establishment of the Ladies' Golf Union, under whose auspices was held the first open ladies' championship, by match play. This attracted the humble entry of thirty-eight, a number which has quadrupled itself, whilst the standard of play has likewise steadily advanced. In the week preceding the championship another important event takes place, for teams of nine a-side representing England, Ireland, Scotland, and, latterly, Wales, compete for the International Shield, each team playing the three other sides under match play conditions. International matches by score play are decided at Ranelagh, where the premier score competitions of the year are held for two days during April. Scottish, Irish, and Welsh championships are held every year. Other important fixtures are the Territorial Tournament, between teams representing four different divisions of England: and the Inter-county Championship, which provides some of the most sporting and interesting golf of the season. The counties are divided into four divisions, north, midlands, south-east, and south-west, every county playing the other counties in its division one out and one home match each year, the winning counties in the four divisions meeting in the finals. The arrangement of nearly all organised women's golf is in the hands of the Ladies' Golf Union, an invaluable body, to which are affiliated between three and four hundred clubs. In addition to managing the championship and other principal meetings, the union works a successful system of universal handicapping, by which all are handicapped to the play of the lady champions. Indeed, women golfers owe much to the endless work and thought bestowed on this organisation by its Hon. Secretary, Miss Issette Pearson, 3, Regent Place, Regent Street, London, W.
Not least amongst the advances made in women's golf since its early days is the class and length of course over which women are allowed to play, and which they prefer. Players living near large towns have to be content with links laid out over pasture land, at worst of clay soil, at best of common turf, and though these courses are excellent in their way, the true links are those which lie amongst the sand dunes of the coast or on land reclaimed from the sea, where the mere removal of the top turf discloses ready-made sand-bunkers, and no alternations of weather destroy the natural elasticity of the turf. Such courses are Formby, Wallasey, Hoylake, Aberdovey, Westward Ho ! Burn-ham, Sandwich, Deal, Littlestone, Rye, Brancaster, to name typical English seaside, links; North Berwick, St. Andrews, Carnoustie, Dornoch, Prestwich, Troon, Machrihanish in Scotland; or Portrush, Newcastle, Dollymount, in Ireland. Scotland they are innumerable - that golf may be pursued in the greatest pleasure and the true refinements of play acquired. For example, only on the very favoured few of inland courses can a player learn that invaluable shot the run-up approach; on seaside links she is bound to acquire it, for no pitched shot travels safely over the undulating turf or stays on the fast greens. The stroke is accomplished by standing considerably in front of the ball, keeping the forearms very stiff, and taking the club back a short distance only and close to the ground. An iron or cleek is the right club for a shot, which is indispensable on a windswept course, since, thus struck, the ball merely skims the ground, and is therefore less likely to be deflected by currents of air. Learning to play well in a wind is, again, an art only to be mastered by bitter experience on a windy day such as is encountered continually by the sea. So she who can join or play over a seaside course will be well advised to do so. Failing that, she should look for one that is laid out over sandy soil with natural hazards of gorse and heather. Ganton in Yorkshire, Holinwell in Notts, Worplesdon, Woking, and Walton Heath in Surrey, Ash-down and Crowborough in Sussex, Hunter-combe in Oxfordshire, are amongst fine examples of courses on the best soil obtainable inland. Entrance fees and subscriptions for lady members range upwards from 5s. entry and 7s. 6d. subscription in some instances in Scotland, to £5 5s. entry and £5 5s. subscription near some large towns, particularly in the neighbourhood of London; but £2 2s. entry and £1 is. subscription is a usual figure.